Renault Twizy Interior, Sat Nav, Dashboard | What Car? The Twizy doesn’t really have an inside. Even with the optional doors fitted – which open in a supercar-esque scissor fashion – you’re far more exposed to the elements than in a normal car with all the windows open. Windows are available as a dealer-fit option but these are similar to the windows in a tent, so aren’t much of a noise barrier, although they do keep out the worst of the wind and rain. The instrument display behind the steering wheel shows you speed, remaining range and how hard the motor is being worked. 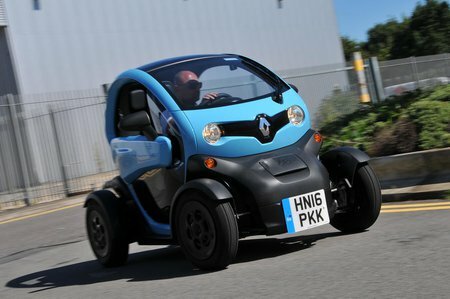 That aside, the interior is pretty bare, which is a good thing given that the Twizy is very much exposed to the elements. Hard plastics and rubberised water-resistant materials are the order of the day throughout. The driver's seat moves back and forth, but that’s it; there’s no height adjustment, and the backrest angle is fixed. The steering wheel doesn’t move, either, although surprisingly it isn’t that hard to get comfortable. There’s no option of a radio, although there is a fairly basic Bluetooth system that allows you to make and receive calls on the move and even stream music from your phone. However, the combination of poor quality speakers and all that background noise makes chatting on the phone decidedly tricky.